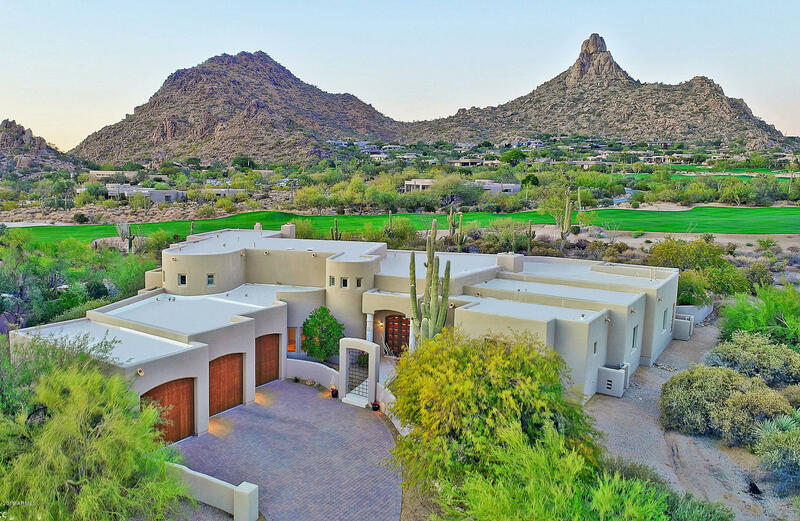 All DESERT HIGHLANDS PHASE 3 homes currently listed for sale in Scottsdale as of 04/25/2019 are shown below. You can change the search criteria at any time by pressing the 'Change Search' button below. "Remodeled Breathtaking VIEWS of Pinnacle Peak, Desert Highlands golf course, and city lights! PERFECT backyard and patios to relax/enjoy, or entertain! This is an absolutely stunning North Scottsdale home that is situated on one of the BEST lots in the famed Desert Highlands Golf Course! Exterior features include massive wraparound patios, custom pool & spa, beautiful landscaping. Great floor plan! Excellent layout to accommodate visitors." "Exquisite GUARDED GATE territorial set on huge, spectacular golf course lot with sweeping views of the 11th fairway and Pinnacle Peak. Breathtaking views from second floor balcony of the fairway and sunset on the mountain. Large, north/south private lot. Extensive use of travertine, rojo alicante marble, cantera and granite. Elegant gourmet kitchen, granite island, Sub-Zero, Viking, cherry cabinets, mosaic dining room floor, Venetian plaster. Expansive glassed greatroom opens to Pinnacle Peak. "